In a move met with celebration by many current and former members of the franchise, the Indianapolis Colts have fired GM Ryan Grigson. It's hardly a surprising move, given Grigson's inability to build a competent supporting cast around franchise quarterback Andrew Luck. 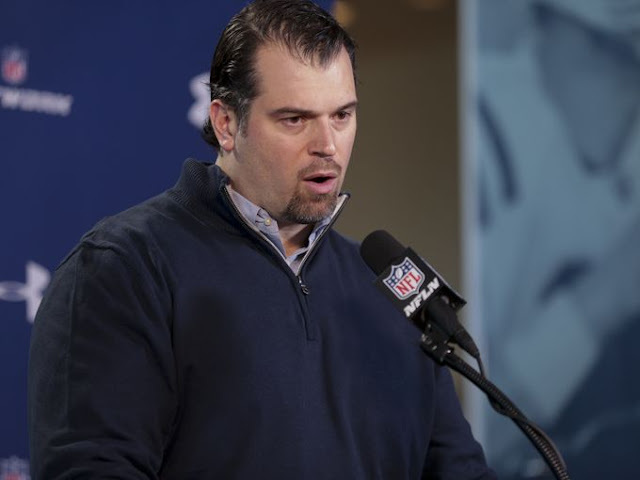 Grigson won NFL Executive of the Year honors in 2012, his first season at the helm in Indy, thanks largely to a draft that landed Luck, star receiver TY Hilton and a dangerous tight end duo of Coby Fleener and Dwyane Allen. Since then, his personnel moves have largely been disastrous. The lowlight was trading a 2014 first round pick for running back Trent Richardson. The third overall pick in the 2012 draft, Richardson flashed talent in his rookie year for the Browns, but managed just 3.1 yards per carry, seven touchdowns and less than 1,000 rushing yards in nearly two full seasons with the Colts. Out of football since getting cut by the Colts following the 2014 season, Richardson rivals Johnny Manziel, the player the Browns acquired via a trade up with the Colts pick gained from that infamous trade, as one of the league's most spectacular draft busts in recent memory. Grigson's failings as the Colts GM go far beyond that one universally ridiculed move. Despite drafting nine offensive linemen in his last four drafts, the Colts failed to build an offensive line capable of protecting Luck. As a result, the franchise quarterback has missed 10 games in his last two seasons, while playing several others hampered by injuries due to the pounding he's taken as one of the league's most frequently hit quarterbacks. Perhaps more damning, he only drafted one noteworthy defensive player (defensive end Henry Anderson, a 2015 third rounder) in his five drafts with the Colts. Even in the seasons when Luck has been able to carry an otherwise mediocre roster to the playoffs, their tissue-paper soft defense was exposed in back-to-back beatdowns at the hands of LeGarrette Blount and the Patriots. In spite of that, Grigson repeatedly neglected the defense in his drafts, comically spending his 2015 first rounder on a redundant speed receiver (Phillip Dorsett) despite several talented defensive players still being on the board. Dorsett has failed to make an impact, even when injuries have opened up opportunities for playing time, but he's still made more of an impact than defensive end Bjoern Werner, their first round pick from 2013. Currently out of football, Werner was the top pick from a draft class that didn't land a single player still on the Colts roster. Grigson's forays into free agency haven't gone much better for the Colts. 2013 saw Grigson make Gosder Cherilus the highest paid offensive tackle in football, only to see Cherilus struggle for two seasons before getting released. He also added safety LaRon Landry that offseason, who failed to make an impact the rare times he wasn't suspended for repeated PED violations. The following offseason, Grigson sunk over $30 million into DT Arthur Jones, who has played in just 17 games during the first three years of his deal due to various injuries. He also signed aging linebacker D'Qwell Jackson, whose gaudy tackle production hasn't led to defensive improvement, and receiver Hakeem Nicks, who was a massive disappointment in his one season with the team. The 2015 offseason saw Grigson go on a spending spree on aging veterans, which backfired when big names such as Trent Cole, Andre Johnson and Frank Gore proved to have little left in the tank. As a result, they finished out of the playoffs for a second consecutive season, despite playing in the worst division in football. All of these failed personnel moves suggest that Pats fans should be sad to see Grigson released by their rival. However, his downfall will likely be celebrated due to his central role in Deflategate. Not only did Grigson e-mail the league office during the week of the 2014 AFC Championship game, alerting them to the Colts suspicions of ball tampering, but it was also Grigson who allegedly poked his head into the executive luxury box during that very game, alerting Troy Vincent, Mike Kensil et all that "We're playing with a small ball". Less than an hour later, Kensil was telling Patriots officials that "you guys are in big f*cking trouble". The witch hunt was on, with Grigson as the rat that started it all. As a result, there's been no love lost between the Patriots and Colts since. That showed up in one of Jonathan Kraft's pre-game interviews. When asked about the quandry of having to spend major money to keep top players, Kraft responded "that's a Ryan Grigson question right there", mocking Grigson's public comments complaining that Luck's contract was hindering his ability to build a defense. That remark was met with ridicule throughout the league, as Grigson failed to build a defense during the four seasons he had Luck on his bargain of a rookie deal. Amusingly enough, rejoicing over Grigson's downfall might be the only thing Patriots and Colts supporters can agree upon. It was known that Grigson and head coach Chuck Pagano didn't get along during their time together, but the reactions from players past and present to Grigson's firings have been telling. "Unwarranted Arrogance" just ran into a brick wall called karma.